Home canning has been practiced for generations since it’s a great way to preserve produce from your garden or take advantage of the bounty of in-season produce from your local markets. 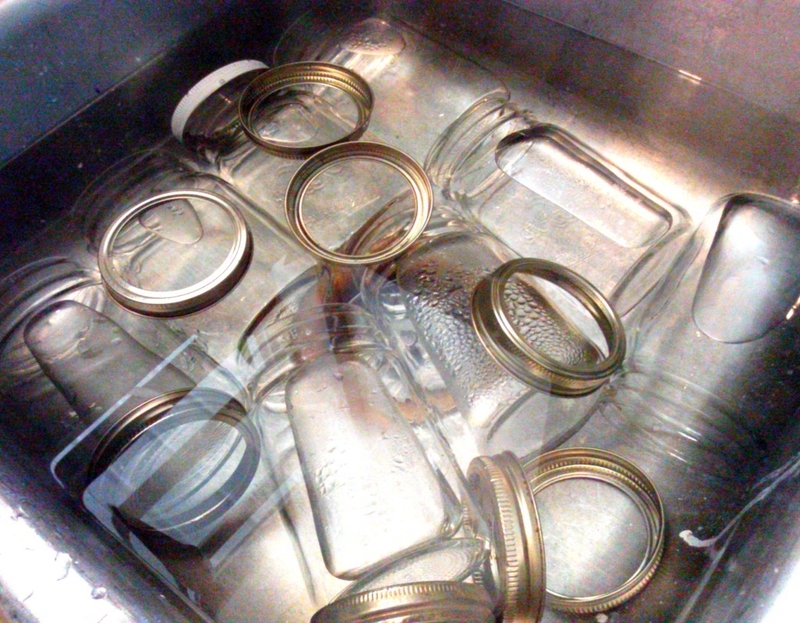 However there is some danger involved if you don’t take the necessary steps to prevent the growth of bacteria or botulism, ensuring the glass jars you use are first sterilized is one of the most important things to do when preserving foods in this manner. Only use those that are made specifically to use in canning, others may not have thick enough glass or be able to bear the heat generated from the process or from the heat of product filled inside. Check for any cracks or chips inside and out as well as along the rims, if so set these aside to use for other projects, these can be dangerous to use since they are more susceptible to breaking during the packing process or allow bacteria to thrive after they have been sealed. Wash them well in hot soapy water and rinse well to remove all traces of detergent. If using older ones that have mineral deposits or a film on them, first soak them overnight in white household vinegar and water (about 1 cup of vinegar per gallon of water) and then wash as noted. Set them right side up on a rack placed in the bottom of a water canner or large kettle and space them about 1″ away from each other and the sides of the kettle. Fill with hot water until it’s deep enough to cover at least 1″-2″ above them. Cover kettle with lid. Bring water to a boil and then continue to boil for 10 minutes (start timing once the water is at a boil). For those who live in areas that are at higher altitudes than 1,000 feet, the time necessary will be longer–typically 1 minute extra per additional 1,000 feet. Once they’re done, turn off the heat and allow them to sit in the hot water until they’re ready to be packed (keep lid on). When ready to use them, drain the water from each as needed being careful not to touch the rim or insidewith anything that hasn’t been sterilized first. Make sure to fill quickly after draining to prevent contamination from airborne bacteria or mold spores. Don’t forget to also process the lids, screw caps and rings as noted by the manufacturer. Server responsed at: 04/19/2019 9 a.m.